Home / Shop / Jewellery / Sterling silver long chain crystal earrings. 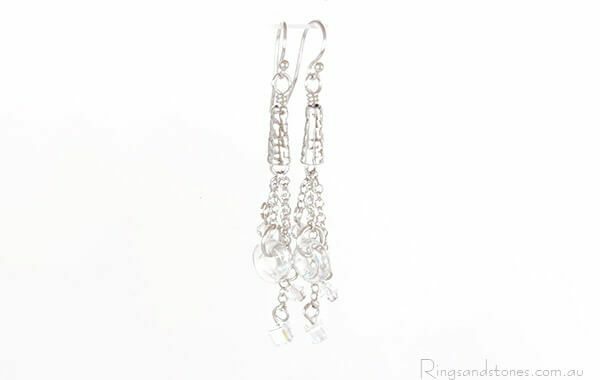 Sterling silver long chain crystal earrings. Modern original sterling silver earrings. 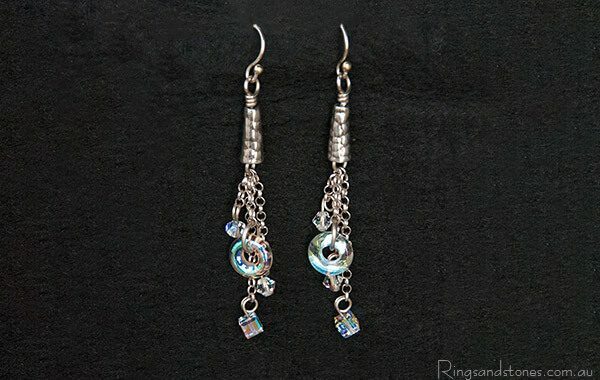 Swarovski crystal beads, cubes and Czech glass rings. All different shapes of clear crystal. These beads sometimes reflect colours of the rainbow, it depends on the direction of the light. There is a sterling silver top hammered cone. Unique artisan designed earrings that capture the light and sparkle. The length from the top of the ear wire is 6.7 cm (2.6″). All sterling silver. Crystals are genuine Swarovski crystals. Ring is pressed Czech glass. The hammered cone is made out of sterling silver precious metal clay (PMC) which is a clay like material that is fired. In the firing process the organic binders burn off and the sterling silver remains. All sterling silver wire used for Rings and Stones products is eco-friendly recycled sterling silver. 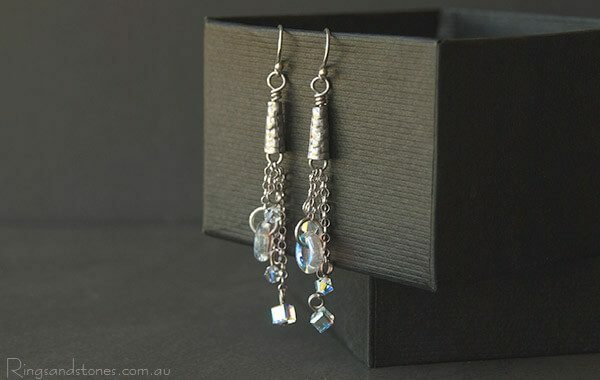 I buy my sterling silver from an Australian supplier committed to best environmental practice using recycled materials. The sterling silver is exactly the same composition as mined silver but it has been recycled from scrap, unused, leftover sterling silver that is melted down, refined and then remade into sterling silver wire and sheet metal. Great for the environment. Look good and feel good too. Handcrafted sterling silver earrings with delightful Murano glass hand blown beads. 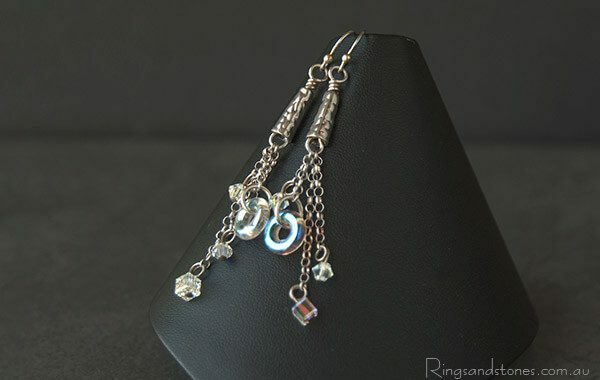 Long crystal chainmaille sterling silver earrings.